"We found Scott and we liked his concept of teaching my son Jeremy with two drum sets side by side. The system of teaching, watching and copying what he plays is awesome! Jeremy has learned so fast. He can't wait to go to drum lessons each week." "When I first started taking lessons I was super nervous, but now after taking lessons with Scott I am very comfortable. He has really has helped me become a better drummer. Scott is a great drummer and a great mentor." "Scott is an AMAZING teacher. My 10-year old son cannot say enough great things about Scott's passion for drums, and his ability to channel that for his students. Scott is THE BEST"
"Drum Lessons with Scott are nothing like your ordinary lessons. With other teachers you sit there and feel pressured to get it right so you don’t get yelled at. With Scott he allows you to take your time to solidly learn how to play what you’re playing. These lessons are exciting to go to as well. You don't sit there for a hr. and go over the same old beat over and over, you share some laughs, learn great drumming and most importantly enjoy playing the drums!" " Taking drum lessons at a studio is 100 times better than taking lessons at in a music store or some basement. I find it really cool that I get the opportunity to take lessons in an actual studio. Just being in that kind of atmosphere makes me want to be a professional musician even more and to work 100 times harder at it...Scotty is a great teacher and he knows what he is talking about and he makes lessons fun instead of something boring like most teachers do...Scott is not just my teacher he's my bro.."
"Unlike many drum teachers, Scotty will not only develop your skills as a drummer, but he will show you the importance of how those skills ultimately need to lend themselves to a sound that serves the music, which is really what drumming is about. As a teacher he will provide honest feedback and constant encouragement that will continuously bring your skill and understanding of drumming to new levels." 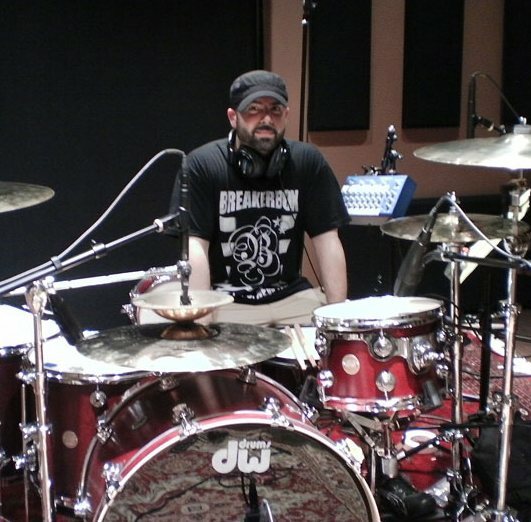 "I am a self taught drummer who had hit the wall and was not getting any better. Scott has combined the basics I never got along with some fine tuning techniques and made me a far better musician in a short time. I recommend his lessons highly." "Learning from Scotty has been a fun experience. Scott has taught me how to take it slow and work at your current level of drumming. He has also taught me that you don't have to be playing like crazy to be a great drummer. Scott taught me to play for the song, move the crowd and taught me how to practice to become a better drummer!" "My son has taken drum lessons from Scott Calandra for several years. He is an excellent teacher and has helped my son to become a very good all around drummer - whether on his drum kit, with his band or in the school ensembles. I have received numerous compliments from my son's school music teachers on his skills and inquiries about who he takes private lessons from - the quality of the instruction shows. Not only has Scott taught the techniques of drumming, but he's also taught my son about the equipment and the music industry. Scott also makes sure to communicate with me about my son's progress. My son looks up to Scott as a mentor. I appreciate his influence on my son very much. I would highly recommend Scott to anyone looking for drum instruction." "Scott is a well educated teacher with a large knowledge base of many styles. He made learning fun and helped me develop my feel, rhythm, drive, timing, technique, phrasing capabilities, reading abilities, abstract drumming concepts, groove, improvisation, and listening abilities. I owe him greatly to my understanding of the instrument, not to mention he is a great friend!" "Scott you've helped me out a lot these past few yrs. Hearing you play; you could tell you put your heart into everything you do and it always made me strive to do better. Your more than an amazing drum teacher though, you’re a great friend. You always listened to me and helped me get through tough situations. I loved having someone close to me like that; it made every lesson a great experience. Thanks for everything!" "My son has been taking private lessons from Scott for several yrs. and he has taught him not only about drums but about different aspects of the music business. He enjoys learning from Scott and has done great in his school music program because of private lessons. I recommend Scott to anyone"
"Scott to me is not only a great teacher; he is personable, good-hearted and looks at drumming as a way of life." "I didn't start drumming until I was 40 years old. I have kids and a busy career, which means; I don’t have a lot of time for much else. Scott shows me the correct things to focus in on. This was key to my progression as a drummer. He really put me on the fast track to maximizing my time to dedicate to my drumming. He really is a drummer’s drummer! A++++ "
"I would recommend Scott to any drummer beginner, pro, young & old. His talents and experiences is what make him a valuable teacher. He will definitely teach you what you need to know." "Since I started taking lessons with Scott about a yr. ago my playing has improved immensely and best of all my friends are impressed with the progress I’ve made. With Scott I’ve been able to learn the way I want to learn. The side by side drum kits make learning easier and faster for me. Scott has also introduced me to many different styles of music which has given me a much broader foundation to build off of. I would recommend Scott as a teacher to anyone at any level." "Scotty has been my teacher for going on 2.5 years now. To say he's the best drummer in NYS is probably an understatement, he is a very gifted and talented musician with the ability to play any (and I do mean any) percussion style and genera. Whether just learning the basics, improving your skill level, exploring new and alternative drumming styles, or just having fun, he is able to help the beginner or experienced drummer. Scott is a patient teacher with a wide variety of teaching methods to help any kind of learner. Through the years I feel the quality of my lessons with Scott is still top notch and he is always finding a way to help me improve and expand my musical ability. Scott is a great drummer, hard working musician, excellent teacher, awesome friend, and incredible mentor."